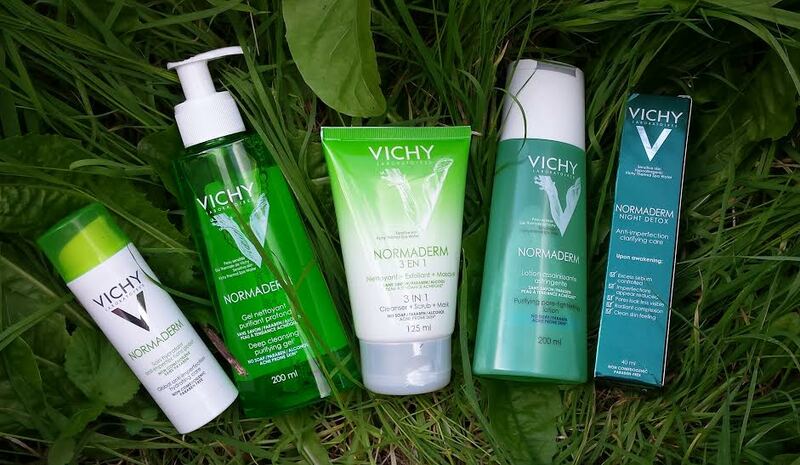 If you’ve been keeping up with my posts – and I hope you have – you’ll know that I’ve been trialling some products from the Vichy Normaderm range. If you missed it you can read the post here. I’ve been trying out the 3 step process day and night for 7 days using the Deep Cleansing Purifying Gel, Purifying Pore-tightening Lotion and Global Anti-imperfection Hydrating Care each morning and using the same cleanse and tone products at night but substituting the Night Detox Anti-imperfection Clarifying Care for the Global at night. I haven’t tried the 3 in 1 cleanser + scrub + mask yet but when I do you’ll be the first to know. So one week on – how is my skin doing? Well I’m pretty pleased over all. To be fair, I don’t have blemish prone skin so I can’t really say how well the spot clearing elements of the products work but as a cleanse tone and moisturise regime I’m pretty impressed. Here’s what I thought of the individual products. This is a really practical pump dispenser that you can keep by the bathroom sink for all the family to use – if you don’t mind sharing your precious Vichy with them. It makes your skin feel really clean without feeling dry or tight. In general I’d stopped using toner, which is what this is essentially, but I don’t know why. Using this lotion was almost like double cleansing and I was reminded that even after using a super purifying gel you can still see some dirt on the cotton wool pad when you use a toner. It also tightened up pores but again without making my skin feel tight. This is a lovely moisturising lotion with no parabens and was perfectly pleasant to use. I do prefer to use a moisturiser with an SPF and also some firming action but this wasn’t the purpose of this product which in the main is to address imperfections. This is the newest product in the range. It certainly hydrated my skin overnight and helped me to avoid the pillow lines that I tend to get when I don’t use a night cream. I was a little surprised to feel that my skin was slightly greasy to the touch when I woke but of course this was soon sorted when I used the Deep Cleansing Purifying Gel and started the process all over again. A great range from Vichy.